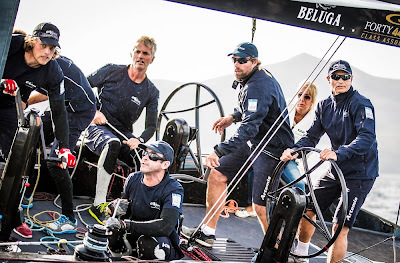 As the RC44’s cruised out of Puerto Calero Marina, past the SCA team base and some of the Mini Transat fleet limping in for repairs, Race Officer Peter ‘Luigi’ Reggio was not hopeful the wind gods were going to play ball on the opening day of the Calero Marina’s RC44 World Championships. A fight for the pin end of the line in the opening race saw three boats, Nika, MAG Racing and Peninsula Petroleum, called over early. Krill Podolsky on his newly branded Gazprom Youth Challenge won the pin and headed left, along with them Brosenosec and Ironbound. The shift favoured the trio who rounded with Brosenosec leading, Gazprom second and Ironbound third. An early gybe by Krill Podolsky didn’t pay, letting Ironbound into second by the leeward gate. With no further place changes in the top three, Vladimir Liubomirov’s Brosenosec took their first RC44 race win since joining the class in June. After an hour’s delay waiting for the wind to reappear, race two started in 8 knots. The 15-strong fleet managed one general recall before getting away cleanly. Ironbound looked strong in the middle of the fleet up the first beat, but it was Igor Lah’s Team CEEREF, coming in from the right, who crossed ahead of the American’s to take the lead. A tight mark rounding saw Peninsula Petroleum and Katusha both penalised for trying to fit into a space they maybe shouldn’t have. At the bottom of the run Team CEEREF took the left hand gate allowing Ironbound to close, a tight cross at the top of the second beat saw the Slovenian team tack on top of Ironbound to take control. The battle for third was equally tight between Nika and Artemis Racing, Vladimir Prosikhin held off the Swedish team for the first lap, only to succumb on the second windward leg. Finishing positions were Team CEEREF, Ironbound, Artemis Racing and Team Nika. 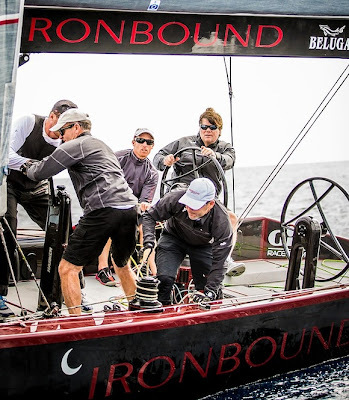 With two second places Ironbound sits at the top of the overnight leaderboard on four-points, Team CEEREF and Artemis Racing tied with eight-points in second and third. David Murphy couldn’t have been happier with the team’s performance. Daniel and Jose Juan Calero have re-joined the fleet after an 18-month break. Jose Juan won the battle of the brothers, a tenth and seventh place leaves them in tenth overall.